What Are The Advantages Of Steam Turbine Over The Steam Engine? Steam turbine can run at high speed, it also has a wide range of operating speed. There are no reciprocating parts in a steam turbine, so there is no balancing problem. Fewer moving parts - The mechanism of turbine is simple and do not have links like piston, piston head etc. the operation of turbine quiet and smooth. Uniform torque and power generation – the steam turbine can produce continues power output, while the power output of engine is not continues. Steam engine gives power only in power stroke. Since the turbine giving continuous power output, the flywheel is not required. In the case of steam engine, the flywheel is important. High efficiency - the thermal efficiency of steam turbine is higher that of steam engine. Large overloads can carry in the expense of slight reduction in efficiency. 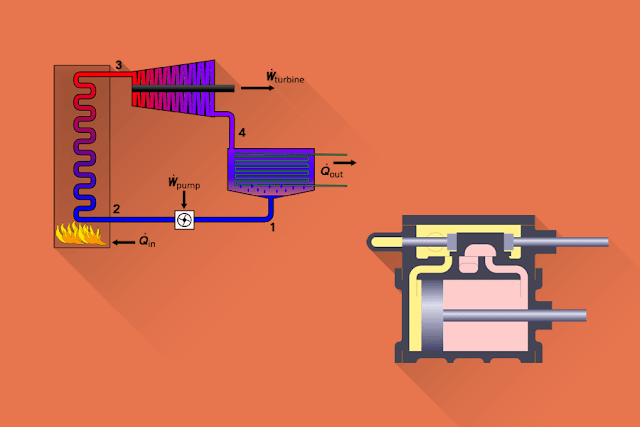 Steam turbine can utilize high vacuum very advantageously. In a steam turbine, there is no loss due to the initial condensation of steam. There is no rubbing part in a steam turbine. So there is no internal lubrication is required. In case of steam engine there are rubbing parts, the lubrication is necessary to reduce friction. Steam turbines can build in large sizes, and they are suitable for higher output. It can be designed to very large power up to 200,000 hp or more on a single shaft.